This article was originally published in the Winter 2002/03 issue of the Expert Witness. The ability to obtain objective, reliable functional measurements of the neck allows for extremely effective diagnosis and rehabilitation for chronic neck pain and whiplash-injured patients. The Canadian Whiplash Centre now offers the Hanoun Multicervical Rehabilitation Unit (MCU) as an adjunct to traditional forms of assessment and rehabilitation. This leading edge, digital technology provides comprehensive objective and valuable cervical functional diagnostic data. It is used to effectively and objectively assess cervical range of motion and neck strength. Together, these measurements quantify the functional capacity of the neck. This differs from other functional capacity evaluations, in that this technology allows us to specifically measure the functional ability of the injured neck. Once functional deficits have been identified and diagnosed, the system can then be used to efficiently and accurately rehabilitate the injured area(s). We have never been able to objectively and reliably assess the strength of the supporting neck musculature with as much accuracy as we can with this new technology. The MCU has proven reliability and reproducibility for measuring both neck mobility and, more importantly, neck strength. Using a sport medicine approach to injuries, we know that regaining muscle strength following injury is a key component to recovery. Quantifying muscle strength guides the decision making in rehabilitation and also acts as an indicator for ability to return to activity. Reduced muscle strength is correlated with reduced functional capacity. Recent research out of the Melbourne Whiplash Centre and LaTrobe University in Australia has identified neck muscle weakness, as measured on the MCU, as a common finding in chronic neck-injured (whiplash) patients. This research has quantified the effects of rehabilitating these strength deficits. Correlation has been established between improvements in neck strength and reduction in pain and disability in the chronic neck pain patient. Chronic neck pain patients (average duration of injury was 8.3 years) underwent a rehabilitation program on the MCU (average treatment length 6.4 weeks). 76.6% of these patients doubled their neck strength, improved their neck mobility by 25% and reduced their pain and disability by at least 50% over the course of this treatment program. At six month follow up they had maintained approximately 90% of these gains without the need for further treatment. We think that these superior results have been achieved because we can now objectively assess and prescribe exercise to strengthen the injured area(s) with more accuracy and reliability than ever before. If we follow the sport medicine model of injury management, then it is generally accepted that exercise as a core component to rehabilitation is beneficial. The difficulty lies in gauging the quantity and type of exercise that will be most beneficial and more importantly, not detrimental. Using objective measures form the MCU assessment allows us to judge this more accurately. The MCU also allows us to precisely control the intensity of exercise, the specificity of the exercise to the injured area(s) and the quantity of the exercise. Graduating the patient from passive treatment modalities into active rehabilitation is now generally considered the gold standard for treatment of whiplash injuries. 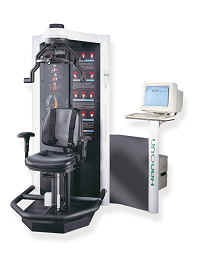 Our rehabilitation program allows us to objectively quantify (measure) functional deficits such as weakness and reduced range of motion in the cervical spine, and then custom tailor rehabilitation using this cutting edge technology to specifically address the deficit(s) responsible for the patient’s disability. The cervical functional capacity evaluation can be used to quantify or substantiate damages that have resulted from the injury. Comparison of the patient’s functional ability can be compared to established benchmarks such as that seen in the normal, uninjured population as well as in rehabilitated chronic neck-injured patients. Damages can accurately and reliably be assessed and quantified. Some preliminary work has also been done to correlate the individual’s performance with sincerity of effort. The results of the functional capacity evaluation can then be correlated with the individual’s clinical picture to explain ongoing problems. As this is quite a new approach to an age-old problem, the patient population that has sought out this treatment has typically been those that have exhausted other, traditional treatment approaches. Even though our results to date are quite encouraging for these chronic patients, we feel there may be more benefit if this treatment can be introduced earlier. Having the ability to quantify the nature and extent of the injury as early as possible will allow for appropriate and effective treatment to be introduced quickly. By re-measuring as the patient progresses through rehabilitation, clinical decisions to either continue, change or discontinue treatment become more objectively supportable. This can help to preventing an individual from entering into a pattern of chronic pain. As a general rule, if the individual is not demonstrating significant improvement and recovery from their injuries at 12 weeks, post injury, then we recommend a functional assessment to diagnose if muscle weakness/atrophy is contributing to the delayed recovery. We have also had some early success in having section B insurers cover the cost of this rehabilitation. Claims managers and their supervisors have provided very positive feedback about this program. They appreciate the fact that this treatment incorporates objective, reliable and repeatable measurements of the neck’s functional capacity, which allows us to track patient progress as well as identify firm end-points to the rehabilitation. If you would like more information or have any questions regarding this new technology, or if you feel that our rehabilitation program we offer may be of benefit to your clients, please do not hesitate to contact the director of the Canadian Whiplash Centre, Dr. Gordon McMorland at (403) 270-7237. Dr. McMorland is a Calgary-based chiropractor. He is the director of the Canadian Whiplash Centre; and has participated as a researcher in both the faculties of Kinesiology and Medicine at the University of Calgary.